Fifa president Sepp Blatter says future World Cup finals should not be decided by penalty shoot-outs. Italy beat France in the 2006 final on penalties and Blatter hinted changes may be made in South Africa in 2010. He said: "When it comes to the World Cup final it is passion, and when it goes to extra time it is a drama. "But when it comes to penalty kicks it is a tragedy. Football is a team sport and penalties is not a team, it is the individual." He said a replay or gradually deducting players in extra time would be a better solution. 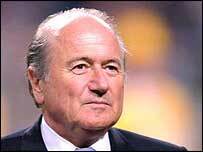 "We have four years or so, so I think we have time," Blatter told a British-Swiss Chamber of Commerce event in Zurich. "Maybe to replay the match if it's the final, you can't do that through the tournament because of lack of time. Maybe to take players away and play golden goal," Blatter said, adding that discussions would start soon. West Germany won the first penalty shoot-out in the tournament, beating France in the 1982 semi-final. Blatter also criticised the high salaries paid to footballers, calling them immoral, and said Fifa would take on the issue as clubs in some countries price spectators out of stadiums in order to pay huge wage bills. "It is not moral, it is definitely not good for our sport," he said. "They pay too much money to the players. There is an imbalance in their finances and they try to get money by all means."